Isack van Ostade was the brother of Adriaen van Ostade who was twelve years his senior and with whom he first trained, according to Houbraken, although other names have also been suggested. His first dated work, Peasants in an Interior in the Alte Pinakothek in Munich, of 1639, reflects his proximity to the rural subjects painted by his brother. Isack is registered in the painters’ guild in Haarlem in 1643 and during that final decade of his life he introduced a series of stylistic modifications that distinguish his work from that of Adriaen. Isack specialised in scenes that perfectly fuse landscape and genre painting, using figures and episodes located in the interior of inns, taverns and farms. 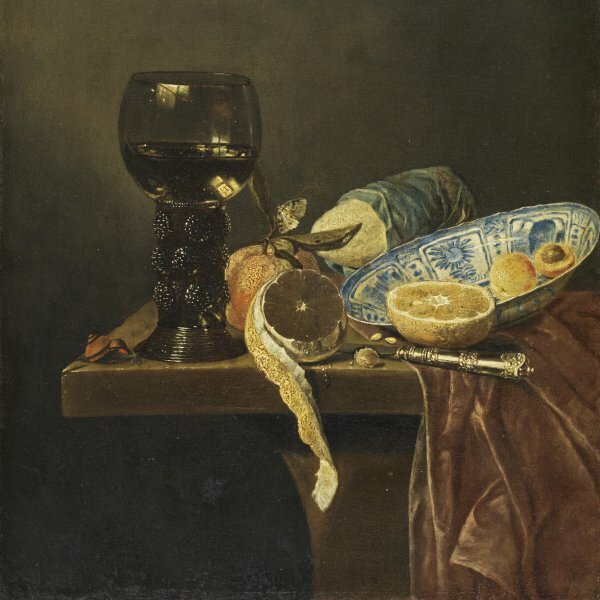 These works reveal the influence of Pieter van Laer. Isack also painted winter landscapes in which the figures engage in sports and games or continue with their normal activities in the frozen countryside. These oils deploy a more virtuoso technique than those of his brother Adriaen, with greater attention paid to the depiction of the figures and to small details, particularly the leaves and branches of the trees. 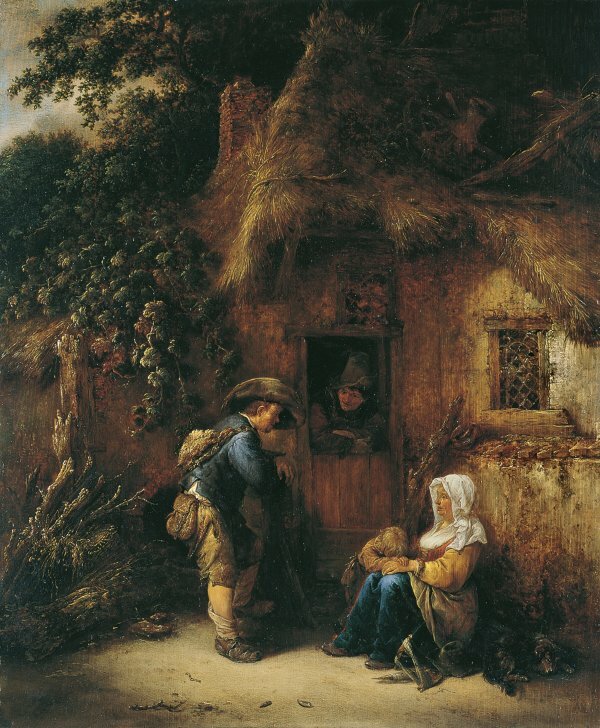 Traveller at a Cottage Door, painted in the year of the artist’s death, is a good example of another subject that Isack painted throughout his short but productive career: that of travellers resting at the doorway of farms or cottages. In this vertical composition we see a traveller or possibly an itinerant worker to judge from his clothes and the objects he carries (a satchel and sheepskin rucksack) at the entrance to a humble dwelling. Van Ostade used the façade of this poor cottage as the backdrop for the traveller and the three members of a peasant family. The traveller is seen standing, leaning on his staff while he speaks to the woman seated on the ground who has placed her spinning tools beside her. Their young son, with his hat on the ground, timidly hides his face in his mother’s lap. Meanwhile the father, inside the cottage, leans out of the door to look at the stranger and listens attentively to the conversation. The quality of the brushstroke and the sensitive handling are evident in the way that the artist has depicted all the details of the composition, such as the thatched roof, the leaves on the trees and bushes and the figures’ clothes. Another notable feature of this traveller, who seems to be asking for work or for information as to where he can find employment, are his shoes, which are worn and dirty from walking and which have blades of grass and straw sticking to them. The scene is illuminated from the left and is painted with a warm tonality that is partly due to the use of an earthy palette that contrasts with the blues, whites and reds of the figures’ clothes. This tonality and the soft outlines that define the forms create an atmosphere typical of Isack van Ostade’s work.